SIMODEC 2018 – the international bar turning machine tool show – in La Roche-sur-Foron, France, and the SIAMS in Moutier are the exclusive venues to get a taste of Tornos’ vision of the future of Swiss-type lathes. The new SwissDECO multitasking platform will be in the spotlight at booth exhibition. The four-machine range of SwissDECO solutions are certain to be of interest to manufacturers from across a wide range industries, including automotive, medical and dental, electronics and aerospace. With its enhanced machining and tooling solutions, the new SwissDECO platform is particularly suitable to fast-growing and demanding market segments and proof of Tornos’ brand claim, “We keep you turning.” The compact machines in the SwissDECO range are successors to Tornos’ DECO and EvoDECO Swiss-type lathes, enabling highly productive, extremely precise and high-quality production of ultra-complex machined parts; thanks to their optimized programming tools and ideal ergonomics, SwissDECO machines speed up parts programming and shorten the preparation for machine setup. Available in two diameters: 25.4 mm with or without guide bush and 32 mm with guide bush and 36 mm without guide bush. All of the SwissDECO solutions are built on a common and sturdy 36 mm base and are designed and optimized with finite element method (FEM) analysis. The platform’s availability in four different versions – SwissDECO G (gang version), SwissDECO GA (gang version with A axis), SwissDECO T (turret version) and SwissDECO TB (turret version with B axis – allows manufacturers to choose the kinematic solution that best fits their needs and is further evidence of Tornos’ customer-centric orientation. Moreover, the SwissDECO machines are designed to be turnkey solutions boasting a full range of benefits. For example, fluid and chip management are integrated for maintenance-free use and blazing-fast thermostabilization. Peripherals are located behind the machine; for example, a paper filter system (option on G version) and a 400-liter oil tank form part of the standard equipment. Compact integration of options is ensured, whether you’re adding an oil mist extractor, a chip conveyor, heat exchanger, fire protection system, high-pressure pumps or, of course, a bar feeder. The SwissDECO G, with its two plattens, is equipped with nine linear axes. The second platten is equipped with a Z axis used for roughing and finishing operations, frontal operations and deep drilling, for example, and enables operations in differential mode. The SwissDECO G features three independent tool systems and is equipped with two plattens; these machines can also be fitted with modular, pre-adjustable tool systems and devices. Thanks to its configuration, and the ability to use plattens, this solution allows extremely fast chip-to-chip times. Available in 25.4 mm or 36 mm, the SwissDECO G has up to 34 tool positions, 20 of which can be rotating tools. Based on the SwissDECO G’s kinematics, the SwissDECO GA version has an A axis and three independent tool systems, and accommodates dual platten tools. The second platten is equipped with a Z axis and a device with an A axis that can be rotated 360 degrees. This device can be equipped with 2x3 tools, allowing work in both main and counter operations. Available in 25.4 or 36 mm diameters, the SwissDECO GA, whose A axis can be fitted with up to six live tools can work in both main and counter operation simultaneously and has 36 tool positions, 22 of which can be rotating tools. The SwissDECO T is equipped with a 12-position turret, further enhancing the vast flexibility of the machine. 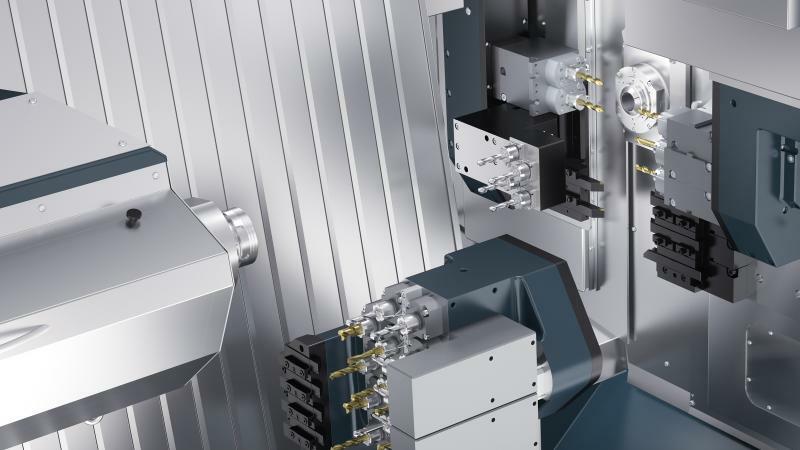 Aimed at the most demanding machining operations and users, this solution’s 12 turrets positions control the live tools and each position can be fitted with up to three tools. Also available in two diameters (25.4 or 36 mm), the SwissDECO T has three independent tool systems i.e. 49 tool positions, 28 of which can be rotating tools. With its internal HP circuit for HP coolant and 36 mm spindle which can be equipped with a high-precision hydraulic brake, the SwissDECO T is conceived to deliver outstanding results on even complex parts. The machine is optionally available with a quick tool-change system to further ramp up its flexibility. Based on the SwissDECO T’s kinematics, the SwissDECO TB is equipped with a B axis to transform the machine into a turn/mill machining solution to give users the flexibility to perform complex milling operations with one single machine. The solution features a 12-position turret accommodating live tools in all positions and up to three tools per position. Optionally, the machine can work and perform machining operations on five simultaneous axes. As on the T version, it is also possible to fit the quick tool-change system. Available in 25.4 or 36 mm diameters, the SwissDECO TB has up to 49 tool positions, 28 of which can be rotating. SwissDECO 26 machines accommodating 25.4 diameter bar stock feature 10,000 rpm liquid-cooled spindles with 27 Nm of torque and 14,000 N clamping force, and ceramic roller bearings guaranteeing thermostability, precision and durability, even at high loads. Spindles for the SwissDECO 36 solutions accommodating 36 mm bar stock feature the most powerful spindle ever installed on a Swiss-type lathe: 8,000 rpm liquid-cooled spindles with 53 Nm of torque and 25,000 N clamping force. Thermostability, precision and durability even at high loads are a given, thanks to ceramic roller bearings. To further enhance machining precision, this spindle can be equipped with a high-precision hydraulic brake system; this is particularly useful on machines equipped with a B or A axis. The SwissDECO’s direct-drive guide bush system features a liquid-cooled, direct-drive guide bush for high speed and accurate machining to reduce cycle times and improve surface finish. The machines can be converted to run without a guide bush in less than 15 minutes, and a handy support for the guide bush is located just above the spindle – no disconnection required. An optional three-position guide bush allowing the use of ISO h9 to h11 bars is available. Achieving complete versatility is easy with the SwissDECO’s tool holding system which is adapted for use with a presetter. Tooling on the turret can be equipped with an innovative one-screw locking quick-change system, providing excellent repeatability. With Tornos’ SwissDECO tooling solutions, users are on the fast track to a wide range of applications including thread whirling, angular milling, polygon milling, gear hobbing and deep drilling. Visit Tornos at SIMODEC and the SIAMS to get a glimpse of the new SwissDECO solutions. Our specialists look forward to your visit to SIMODEC (booth A38) from March 6-9 and the SIAMS exhibition (booth C4/D3, hall 1.1), taking place April 17–20, in Moutier, Switzerland.